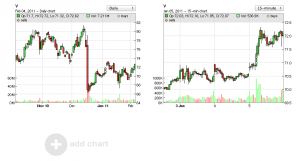 Adding charts – now much easier! As our support mailbox can attest, it seems that it’s not obvious that you can add additional charts to your trade views beyond the two that it defaults to when you create a new user account. So, we took the hint and changed some of the GUI on the trade screen. As before, you can change your chart settings in the User Settings area, which you can get to by clicking your username in the upper right corner, or clicking “Change default chart settings” at the bottom of every trade screen. 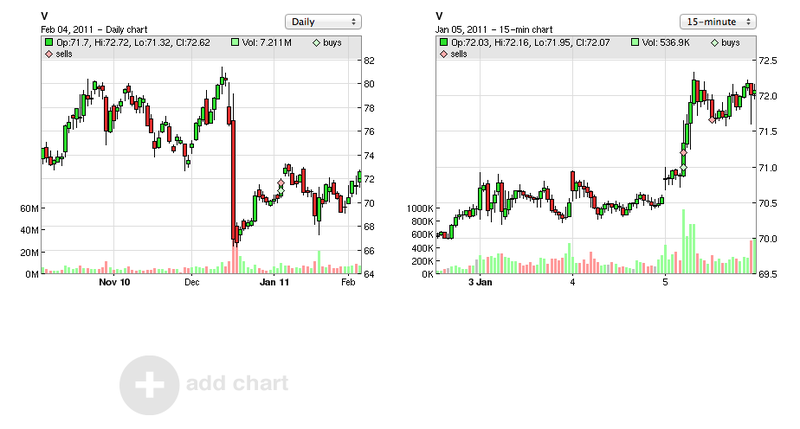 You can set the default timeframes your charts will use, how many charts you will see, and the type of chart you want. And, as before, you can override your default timeframes on your charts for a particular trade by changing the timeframe in the drop down list above each chart. But now, you can also add charts on a per-trade basis. So for example, if you have two charts set as your default, but for one particular trade you want to have three charts, it’s now quick and easy – you just click the add chart button! This won’t change your defaults – it will just quickly add a chart to the trade you’re looking at. This entry was posted in Announcements and tagged charts by gregr. Bookmark the permalink.